Also, time to find out who the fastest man in the world is. No pressure. EVERY MORNING, WE bring you all of the info you need to make sure you don’t miss a second of Olympic gold. We’ve reached day nine of the Games and it’s a big one both at home and abroad, as John Joe Nevin boxes for a place in the semi-finals of the Men’s Bantam. On the track, there’s the small matter of deciding who the fastest man in the world is. Usain Bolt and Yohan Blake will be expected to get through their semi-finals, along with the likes of Justin Gatlin, Tyson Gay, Asafa Powell and Dwain Chambers. Events get underway with the women’s marathon at 11am, but the whole day will be leading up to one thing – the final of the men’s 100m at 9.50pm. It’s the Usain Bolt v Yohan Blake show in that event, with both men impressing in their heats on Saturday morning. Elsewhere, the men’s 1500m semi-finals takes place without, unfortunately, the presence of Ireland Ciarán O’Lionaird. We also have the ladies’ 400m final, but sadly without Kilkenny’s Joanne Cuddihy. There’s also the men’s 3000m steeplechase final to look forward to. Wimbledon may have ended in tears but Andy Murray has the chance to partially wipe away those memories when the Briton takes on Roger Federer in the men’s final. Whatever happens, the match is unlikely to be as one-sided as Serena Williams’ victory over Maria Sharapova yesterday. Caitriona Jennings, Ava Hutchinson and Linda Byrne all go in the Women’s Marathon at The Mall at 11am. 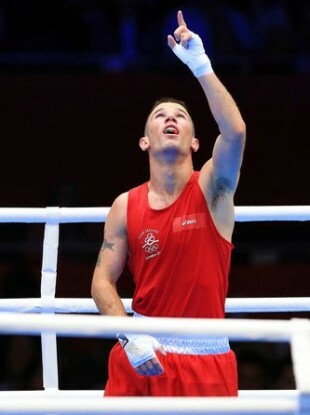 John Joe Nevin is just one fight away from Ireland’s first medal of the Olympic Games and he comes up against the Mexican boxer Oscar Valdez Fierro in Sunday’s quarter-final clash at 8.45pm. Derek Burnett is in action early on Sunday as he takes part in qualifying for the final of Men’s Trap event, which will take place in the Royal Artillery Barracks on Monday. Round 1 takes place at 9am, Round 2 is at 11am and Round 3 is at 1pm. In the Omnium, Martyn Irvine made it through Saturday’s elimination race and will take his place the 4km Individual Pursuit against Canada’s Zachary Bell. Irvine’s is race number five, so you’ll catch him if you tune in before 10.30am. After the Denis Lynch fiasco, all eyes will be on Billy Twomey and, in particular, Cian O’Connor as the second qualifying round in the Individual Jumping takes place in Greenwich Park at 11am. Not to sound like a broken record, but the Men’s 100m final will attract even the most fairweather of Olympic fans, especially give the fact that Yohan Blake beat Usain Bolt twice in the Jamaican trials and barely looked like he had broken a sweat in the heats. When you also have the somewhat tainted presences of Dwain Chambers and Justin Gatlin, it will make for an explosive set of semi-finals and final. We almost neglected to mention it, but the Irish duo of Peter O’Leary and David Burrows go in the Men’s Star medal race at 1pm – that will not be one to let slide. Finally, Ryan Seaton and Matt McGovern will compete with home favourites Stevie Morrison and Ben Rhodes in the Men’s 49er. Email “Olympic Breakfast: John Joe Nevin on the brink of glory”. Feedback on “Olympic Breakfast: John Joe Nevin on the brink of glory”.